The Project consisted of the modernization of the amphitheater along with re-engineering of two air handling units underneath the seating tiers totaling 49,000 CFM. The Architect of Record was Smith Group JJR and the project was designed in 3D using Revit. Construction documents were produced using Autocad. S.R.Gupta, P.C. 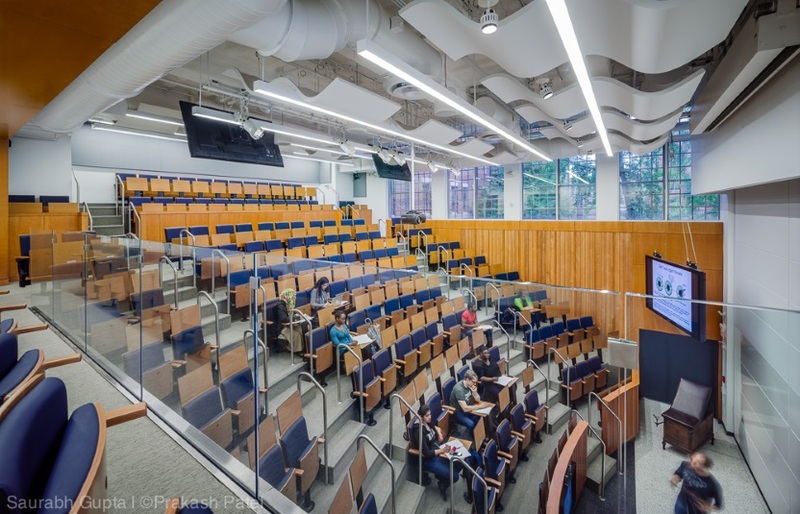 served as the Engineer of Record for the multimillion dollar teaching amphitheater renovation. The state of the art facility included power and sound to each seat along with multiple large scale monitors hung from the ceiling. The HVAC design engineer's challenge was to attenuate the sound from the large air handling units located underneath the seating tiers. Sound attenuators and low velocity ductwork systems were designed to attenuate the HVAC sound. Variable frequency drives were added to both the supply and return fans and the system was converted to a hybrid VAV system.